Vohra had yesterday held a meeting with Chief Minister Mehbooba Mufti to discuss the student protests. 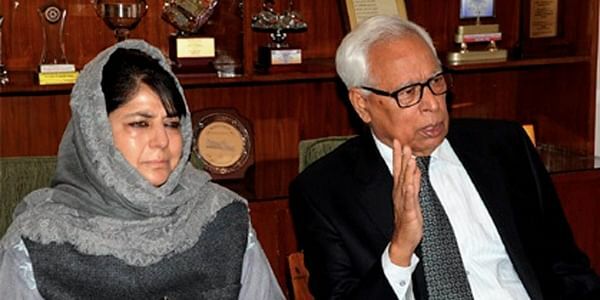 SRINAGAR: With no let up in student protests in Valley, Jammu and Kashmir Governor N N Vohra has taken upon himself to resolve the issue and is holding series of meetings with Chief Minister, Education Minister, opposition leader and academicians to find a way out. “Governor Vohra is deeply disturbed by student protests leading to public disorder and has been repeatedly stressing his concern that the educational interests of the student community must be vigorously advanced and selfishly protected and, under no circumstances, should the future careers of the student community be allowed to get exploited or compromised in any manner,” a Rajbhavan spokesman said. During the meeting, Governor had urged CM to take all required steps for ensuring that the student community is immunised against any involvement in law and order situations. There have been daily student protests in Valley after April 15 raid of security forces on a college in south Kashmir’s Pulwama district during which over 50 students were injured. Even today, there were student protests in Pulwama and Srinagar during which the protesting students clashed with security personnel. The female students have also been participating in the protests and on many occasions the female students pelted stones on cops amidst chanting of pro-freedom and anti-India slogans. In view of clashes in Srinagar today, authorities have decided to suspend class work at SP Higher Secondary School and Women’s College M A Road tomorrow. The colleges in Valley had remained closed for a week after Valley-wide student protests on April 17. In view of continued student protests, Governor Vohra, who recently had a detailed meeting with Home Minister Rajnath Singh in national capital, held deliberations with State Education Minister Syed Altaf Bukhari today. The minister briefed him about the steps taken to prevent students from staging protests and clashing with security personnel. Later, in a statement Bukhari said students should have been busy and involved in academic and co-curricular activities rather being chased by law enforcing agencies on the roads. He appealed students to return to their classes and not to waste their precious academic time on roads. Former J&K Chief Minister and opposition National Conference working president Omar Abdullah also called on Governor Vohra today. “The Governor discussed with Omar the measures required to be taken at this juncture and particularly urged that all political, religious and society leaders must closely join hands to secure the restoration of peace and normalcy and especially ensure against the academic interests of students being adversely affected in any manner whatsoever,” a Raj bhavan spokesman said. Sources said both were concerned over student protests and favoured resolving of the issue at the earliest. The Governor also held deliberations with Vijay Dhar, President of D P Dhar Memorial Trust which runs the DPS School and Vice Chancellor University of Kashmir Prof Khurshid Andrabi to discuss the student protests. During his talks with Andrabi, he stressed the role and responsibilities of the Vice Chancellor, Deans and faculty in ensuring against any unhealthy influences being allowed to adversely affect the teaching schedules in the colleges and universities. The Rajbhavan spokesman said after deliberating on factors which have led to the involvement of students, even girls, the Governor has decided to hold further meeting with the Vice Chancellors and other stakeholders for agreed further action being taken for ensuring against recurring disruption of the educational system in Kashmir.